Democratic Presidential candidate Sen. Bernie Sanders (I-Vt.) released a sweeping immigration policy paper on Tuesday that pushed for pro-immigration policies that are arguably more ambitious than those proposed months ago by rival candidate and former Maryland Gov. Martin O’Malley. Hands down, the plan in more progressive, and more specific than former Sec. of State Hillary Clinton’s positions on immigration. Below, we list the 20 reasons why, starting with the fact that Sander’s new document is far more detailed than any of Clinton’s statements. To be clear, these aren’t all actions that Clinton has refused to take. Plus, there’s no guarantee that Sanders could even execute this ambitious set of policies. At first glance, his legislative immigration agenda appears to leave little room for compromise with conservatives, demanding even less concessions from Republicans than the 2013 comprehensive immigration reform bill that failed to make it to the floor of the House. Still, Sanders is pledging to address immigration during his first 100 days in office if elected, and he’s provided specific promises on executive actions that he would take, with or without a vote from Congress. Like Clinton, he has said he would “go further” than sitting president Barack Obama. In this new proposal, he’s specified where “further” is. The announcement comes at a time when Sanders and Clinton are gearing up for a primary fight in February and March in heavily Latino swing states like Nevada and Colorado. Clinton currently holds a solid lead in both polls and organizing power in those states. Both candidates have pledged for fight for comprehensive immigration reform, vowed to make immigration enforcement more humane and rejected Republican policies that would make border enforcement a precondition to finding a legal pathway for the country’s estimated 11 million unauthorized immigrants. 1) First and foremost, Sanders now has a more detailed immigration proposal than Clinton. While both candidates might agree on some major policy objectives, we don’t know where Clinton stands on specifics like Border Patrol accountability or family detention. 2) Increase access to legal counsel. Unlike criminal defendants, immigrants facing deportation don’t have the right to a state-appointed lawyer. 4) Reduce or cease deporting immigrant to "unfamiliar locations." Busted for crossing the border from Mexico? Under current rules, you get be deported to pretty much any part of your country. 5) Require Customs and Border Patrol agents to wear body cameras, something that the agency recently refused to do. Sanders also called for agents to be held accountable for excessive force violations, something that activists say the CBP is not currently doing. The agency disagrees. 6) Reduce or eliminate border checkpoints inside the 100-mile border zone. Probably more exciting for libertarian YouTubers than actual immigrants, this proposal seeks to end a quirky rule that groups like the ACLU claim eliminate the 4th Amendment along an arbitrary swath of the country. 7) End Obama’s Priority Enforcement Program, a toned down version of the Secure Communities program that deputizes local law enforcement to help immigration officials. 8) Expand "parole in place." Like DACA or DAPA (Obama's deferred actions for DREAMers and their Parents), “parole in place” allowed undocumented immigrants to stay in the U.S. without fear of deportation. Currently, it is only available to spouses, parents, and children of military personnel. Sanders proposal seeks to flip that requirement to include a class of aggressors: gangs. Depending on how this is ultimately phrased, this proposed class of asylum seekers could include a significant percentage of the population of El Salvador. 10) Whistleblower visa: immigrants who are important witnesses in domestic violence and other violent crime cases have access to a U-Visa. Sanders wants another visa that allows immigrants to live and work in the U.S. if they are witnesses or plaintiffs in Labor disputes. 11) Additional funding to the completely swamped immigration court system. 12) End family detention. As a member of the Obama administration, Clinton has come under fire for supporting family immigration jails. She’s since said that the practice should be reduced or eliminated, but hasn’t pledged an all-out ban. 13) Sanders wants to take this a step further and end all private prisons, both criminal and for immigration. Sanders supporters say that Clinton has received donations from top prison companies like Geo Group, and is beholden to their interests. Bernie Sander’s immigration reform proposal may be liberal to the point of undermining his own professed commitment to passing legislation. Could the follow proposals permanently sink comprehensive immigration reform? Let us know what you think. 15) A pathway to citizenship within five years. That's a big shift from the slow, cautious hurdles laid out in the 2013 plan. 16) Reduce punishments. “Future immigration reform should not add onerous fines on top of [...] administrative fees.” The popular 2013 senate reform bill included a fine $1000 as a punishment for breaking the law. Take that away and it’s closer to the definition of amnesty that became the rallying cry for immigration reform opponents. Below, the pro-immigration CATO institute explains why the 2013 bill was so far from how "amnesty" is used in common parlance. 17) End three-to-ten year bars. We haven’t listed every proposal in here that echos Martin O’Malley’s immigration plan. This is one of them, and it would allow immigrants who are in the country illegally a way to stay in the U.S. while they get their immigration status normalized by applying for a visa. 18) Access to health care subsidies under Obamacare for most undocumented residents. Clinton has said that she only wants immigrants in the country illegally to receive health care subsidies if they are minors. 19) Change temporary migrant visas so that workers aren’t reliant on a single employer. Right now, seasonal migrants with poor working conditions have a huge disincentive to report abuse: if fired, they are eligible for deportation almost immediately. This is partly due to the current visa framework, in which employers are responsible for the costs of the visas. 20) In-state tuition for DREAMers. Clinton says she wants to leave this up to the states. Sanders says all undocumented immigrants who meet residency requirements should be eligible for in-state tuition and financial aid. We’re still picking through Sanders’ immigration proposal. There are elements in the plan that might seem more “conservative” on immigration. For example, the Senator wants to tighten requirements for temporary worker visas and make companies to pay higher wages. We’re also waiting on a response from the Clinton and O’Malley campaigns, who did not return our requests for comment on Tuesday. 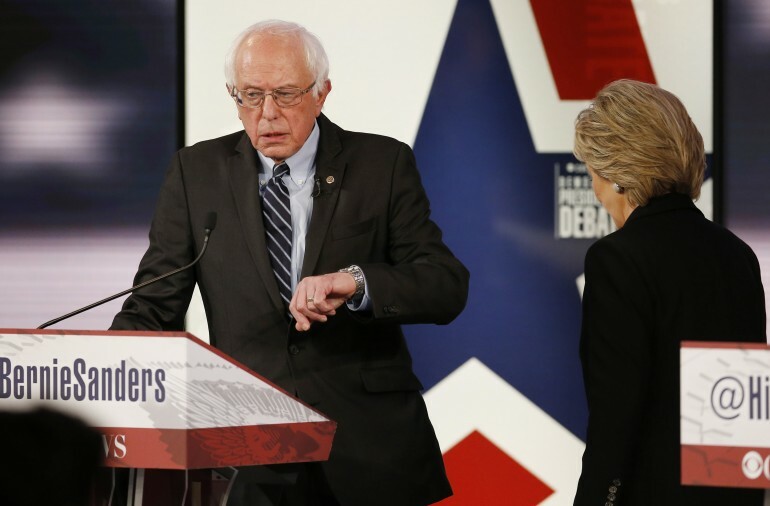 For now, we’re interested in your thoughts on Sanders’ proposal. Let us know what you think in the comments below.